Our gift shop offers a unique range of handpicked gift and home ware products from the UK and Europe with our experienced team of buyers constantly searching out new and exciting suppliers. Our aim is to continue to offer products that not only keep up with the latest trends and fashions but also match our own standards on quality. We have our own display team in house that continually refreshes all our displays to keep providing new ways to inspire and showcase ideas to decorate your home. Give your home a natural home grown, healthy feel. With the soft yellow colours. New in our centre this year, is our Flower Market. 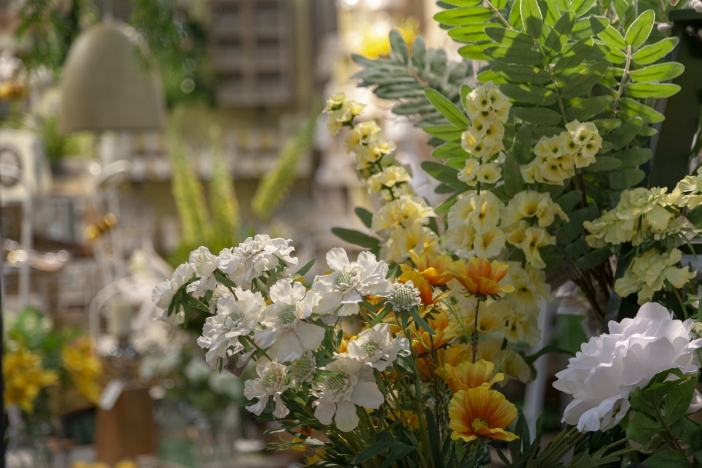 Come along and see our wonderful displays of silk flowers, giving you inspirational ideas for your home. Our Kitchen Department this year has some wonderful ranges for your home including T&G Woodware, Emma Bridgewater, LSA International Glass and much more. Want to treat someone special? Let them choose from our great departments in-store. Buy in-store or online.